Arthur Saxon claims to be the strongest man in the world, and the marvellous feats he performed at the Newport Empire on Monday evening would seem to justify that claim. This modern Hercules is a man of powerful build, of magnificent physique, and with muscles literally as hard as iron. He and his two partners lift and twist and twirl about heavy bar-bells with as much ease as though they were four pound weights. 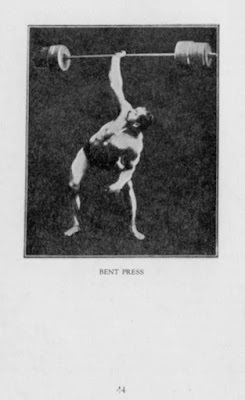 Arthur Saxon demonstrates that he can support with his legs and arms considerably over a ton. Ten men are marched on to the stage and seated on a heavy plank which Saxon balanced on his legs; then he raised his two partners and another man, making thirteen men in all, on a 150 lb. bar-bell, which he held in his hands. He gave a challenge to meet all comers at 24 hours' notice. The youngest of these Samsons lifted a 119 lb. 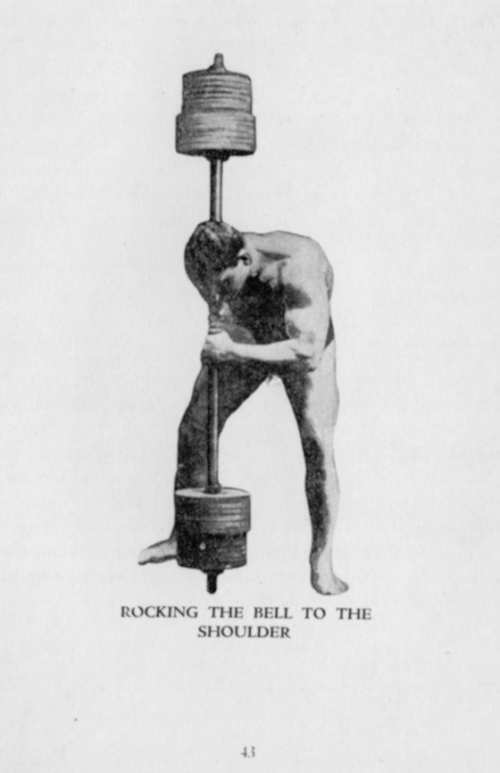 ring-weight with a man on top of it. Arthur Saxon raised two men over his head on the bar-bell while he held a third in his teeth. The other feats were equally marvellous, as a great a weight as l,420 lbs. being lifted on one occasion. The whole performance was carried through without a hitch, and the Saxons well deserve the hearty applause which they received. It has been conjectured by the late John Huxley, the late Prof. Lecky, and Mr. Daniel Leno, sitting in Grand Council, that there are precisely 273 claimants to the title of the "strongest man on earth." I am not going to say that Arthur Saxon is the strongest man on earth. Personally, I believe he is, but I cannot prove it. All if can say is that if there is a stronger specimen of the "genus homo" than this magnificent mass of brawn and muscle, I should like to see him. Interviewed the other day, Arthur Saxon gave some interesting details about himself. At the first glance Saxon does not strike one as being anything beyond an ordinary individual you may meet in the street, but stripped - then is the difference. Just under 14 stone in weight, he carries a 48in. chest, is 24in. round the thigh, 171/2ins. Round the upper arm, the same around the neck, stands 5 ft. l0 ins. In height, and was born as recently as 1878, being consequently just now at his best. 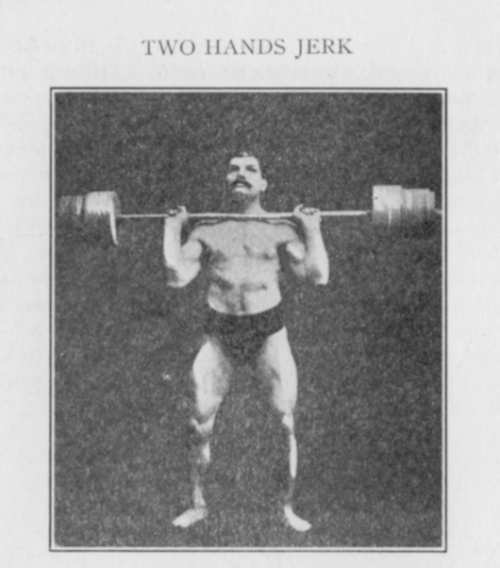 Arthur Saxon hold the world's record for a one-handed lift. This formerly stood to the credit of Louis Cyr (262 lbs. ), the next being Sandow's 254 lb. made at the Aquarium and Royal Holborn respectively. Arthur Saxon night lifts a bar-bell weighing 300 lb., but last year went for the record, the weight being 314 lb. 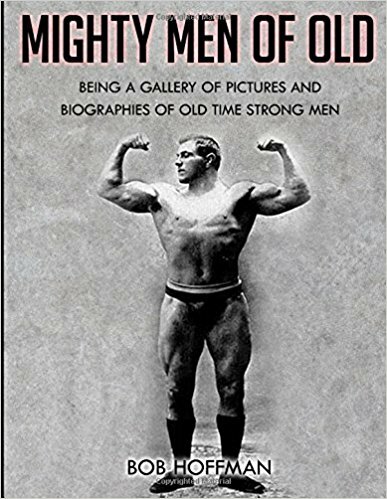 There was a number of amateur and professional strong men present to bear witness to the bona fide of the weight, which turned the scale at 314 lb. Resting the bell on end, Arthur Saxon raised it to his shoulder, and, amidst great silence, essayed the arduous task of pressing it aloft with one hand. The strain was terrific, but without wasting any particle of his strength, Arthur held it aloft for the space of about a quarter of a minute. His success was greeted with loud and prolonged cheers. So says the Sporting Life, so there is no doubt about the genuineness of the performance. Also people will be interested to know that a surprise visit was paid to the hall where the Saxons were performing by the representatives of a health magazine, who had all the bar-bells weighed, and found that, like Caesar's wife, they were above suspicion. Arthur Saxon, indeed, is always most anxious for investigation into his performance. His brothers, Hermann and Adolf, are little less strong, and between the three the list of records in weight-lifting has had a bad time. The brothers Wirth, who were in past years so well and favourably known in Utenhage, opened their great Australian Circus to a fair audience last night, and the season will close with the performance tonight. Of the performance generally, we can only say that it is the best show of the kind we have seen in Africa, and, indeed, with regard to the performances of the Brothers Howard (the world's greatest Mystifiers), and the Saxon Brothers (the world's greatest Strong Men), we have never seen anything approaching it in the Old Country. . . . The exhibition of strength given by the Brothers Saxon is a show of itself, and a good one too. In Arthur Saxon and his brother one sees models of men as described in ancient mythology, such as Achilles, and a few others of the ancient "swells." 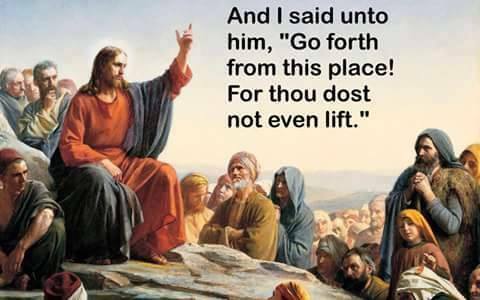 But to see him in his endeavors to raise a bar-bell weighing over 300 lbs. above his head, reminds one of Atlas, with the world on his shoulders. Bar-bells up to this weight are flung about and held in different positions by these "wonders of men" as if they were walking-sticks; and lifting over 1,000 lbs. with the teeth, and bearing over 2,000 lbs. off the ground, are feats that no other man in the world could perform. 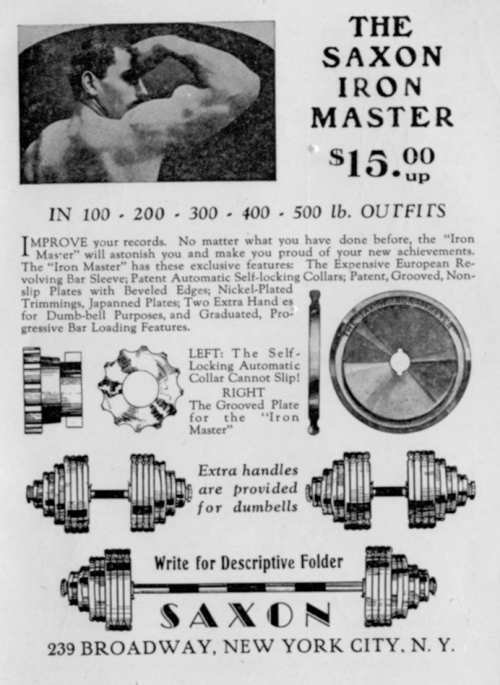 Even the great Eugen Sandow cannot compete successfully with Arthur Saxon who has a wager of L1,000 to compete with any man (Sandow included) in trials of strength. The youngest of the Saxon Trio, now engaged at the Circus, had his right elbow dislocated during the performance last evening, whilst supporting 2,000 lbs. dead weight on his chest and legs. Saxon is but 17 years of age, and the applause greeting his feat was at its height, when the board on which the weights are placed snapped, throwing him on his side. He showed good pluck, walking out of the ring apparently quite unconcerned. In response to inquiries this morning, it is said he will probably be all right in five or six days. The opening performance of Wirths' Grand Circus was given last night. The Company is a strong one, and the items, from start to finish, were gone through without a hitch. The Brothers Saxon, billed as the strongest men on earth, brought down the house, literally, and a portion of the gallery actually, by their feats of strength. Nine men and a big bar-bell is a big load to sustain, but his was managed, apparently without effort, by Mr. Arthur Saxon. The total weight lifted is almost beyond belief, and having regard to the character for veracity always borne by the "Advertiser," we hesitate to state it. However, any of the audience are invited to lift the bar-bell and weights, and there can be no doubt about the avoir-dupois of the band who were supported in the air. Wirths' circus drew a crowded house last evening. The artists - a really first-class combination - were all in good form, and every turn was greeted with hearty applause. The Brothers Howard speedily convinced the most sceptical, and loud cheers followed their unique entertainment. The greatest attraction of the evening was a wrestling match, Graeco-Roman style, between Messrs. Arthur Saxon, described as "the strongest man in the world," and Wilson Hayston, the "champion wrestler of South Africa." It was a case of brawn v. muscle, and also of condition v. non-condition, Saxon, of course, being in splendid trim, while Hayston was in anything but proper wrestling fettle. The contest proved a close and exciting one, interest being sustained from start to finish. The first fall went to the strong man, after a protracted struggle. The second nearly fell to Hayston, at the outset his opponent managing to keep his shoulder blades off the ground by the sheer strength of his forearms. Wilson was not to be denied, and soon had his man down again, this time his weight gradually told, and Saxon had to give way, loud cheers greeting the local man's success. The third was another long bout, but Saxon always looked like having the best of it, and two or three unsuccessful attempts, managed to bring and keep his man down, thus winning the match. Considering his lack of condition, and far from intimate knowledge of this particular style, Hayston did very well, and, though beaten, was certainly not disgraced. 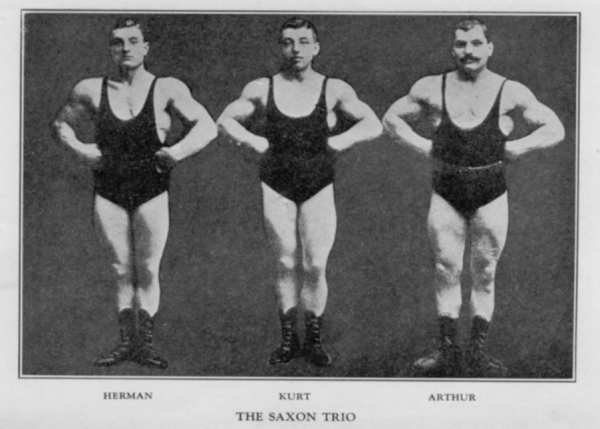 The Saxon Brothers, who are exhibiting feats of strength at Wirths' Circus, which shows here for the last time to-night, are probably the youngest performers in their line who have become famous during the last two or three years. It will have been noticed that their feats of juggling with weights are performed with great dexterity as well as an ease which comes only by practice, and an evidence that the weights are genuine has been afforded by the laughable and egregious failures made by various members of the public who have attended the circus. The strong men look on and smile at the attempts, and that L5 note remains serenely in Mr. Wirth's waistcoat pocket. In fact it seems that a prize in Rodney's Sweep is easier to obtain. 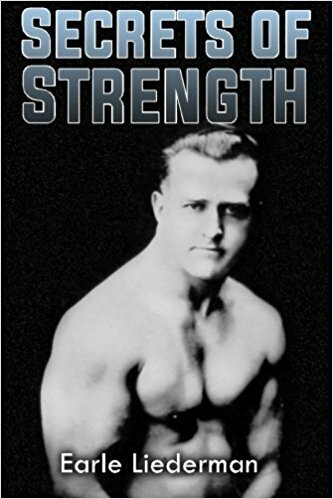 It was with an idea of learning something about the weight-lifting business from one of the most successful exponents of the art or science whichever it should be termed, of recent times, that a Chronicle man called on and saw Mr. Arthur Saxon at he Imperial Hotel. His appearance in black trunk hose and flesh-coloured or pink tights in the circus ring is well-known. There you a good-looking young man, neither dark nor fair, but something between, whose figure by its splendid proportions, arrests the eye at once; the grand development of the chest, shoulders, arms and neck are patent to a casual observer. And if you see Mr. Saxon at close quarters and examine him, you will find that the muscles which are in most people quite small, the abdominal ones, for instance, so prominent in the Farnese Hercules, are fully developed. His strength does not lie particularly in any one place, it seems to be evenly distributed. Mr. Saxon, it must be admitted, does not show to such advantage in his ordinary everyday dress, but he is an unassuming young man, speaks English well for a foreigner, and had no objection to give the pressman a few facts about his career. 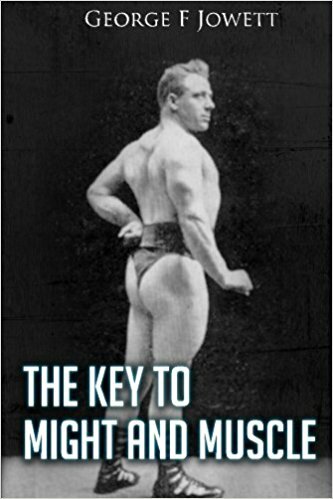 He was born in Saxony in April, 1878, and first began as an amateur to practice heavy weight-lifting at the age of 17. In a few months he succeeded in going up from handling 100 lbs. to a weight of 224 lbs. He obtained his first important engagement in 1898, making his debut in Oldham. Sampson was present when the challenged all comers at Burnley, but did not essay the trial. The Saxon Brothers performed in England for two years. Mr. Adolf Saxon is also a finely-built man and executes many clever feats, being practically equal to Arthur Saxon in all but the crowning feats. During the two years they were in England they never found anyone who could lift the big bar-bell above his head with one or both hands. 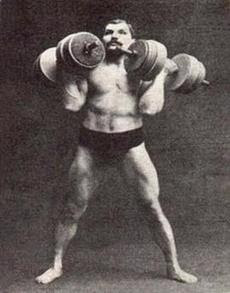 Arthur Saxon's greatest feat was done when he lifted 268 lbs. with his right hand above his head and 100 lbs. with his left, a total of 368 lbs. The weights were weighed on scales previously. From this, and the fact that he has an open challenge to all comers, it may be acknowledged he has reason from claiming to be the strongest man in the world. In height, Arthur Saxon is 5ft. 10ins. His weight is about 212 lbs., chest measurement, 47 or 48ins., biceps and neck, each 17 1/2 ins. The principal item, however, was reserved the last. This was a much talked-of and looked-for wrestling match between Arthur Saxon - the strongest man in the world - and Mahbool Khan, the champion wrestler of Ceylon. Both men took seats at either end of the ring amid deafening applause, but before the real business commenced Mr. Wirth called for a referee and timekeeper, both of whom were forthcoming, the former being Mr. Money, Drill Instructor. The audience were then informed of the conditions; namely, that the winner of two falls out of three would be declared the winner, the falls to be on the back only. Soon after the struggle commenced the strong man came to the ground but face downwards, and the almost superhuman efforts with which he raised himself and almost threw his opponent to the ground evoked considerable applause, but very little headway was made, and at the call of time neither man seemed to have won. At this juncture, however, Mahbool Khan left the room, and in spite of repeated calls would not return. He was allowed two minutes grace, failing which Mr. Wirth announced they would declare in favour of Saxon, and as the Afghan did not return, Arthur Saxon, amid loud cheers, was declared the winner. This terminated the most interesting performance. We would advise those who have not done so already to pay Wirth's Circus a visit without delay. As already announced, performances will now take place every night in the Parsee Theatre, while on Saturday there will also be the usual matinee." The Brothers Saxon, "the strongest men on earth," next appeared, and performed some wonderful feats of strength; one of the feats was lifting a 325 lb. 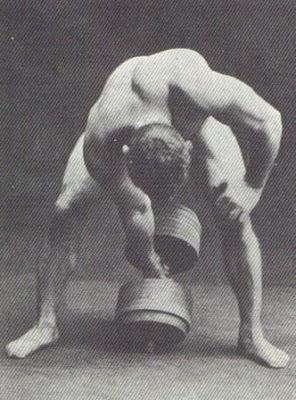 bar-bell with one hand above the head. This is said to be a world's record. The brothers, who are quite young, one is not 22 - so young and yet so strong - did many astonishing things. Among other was the balancing of the M.V.G Band on a board, which the young giant supported on his feet, whilst they in evident trepidation played dolefully, and the amateur Atlas juggled with some thousand pounds of bar and other bells. The man who could bear all this, and the music, must be indeed strong. Mr. Arthur Saxon offers to wrestle with anyone. Any takers? I take it for granted that no one can enter into training for any sport, including weightlifting, and even practise for physical development only, without encountering monotony in training, which threatens to upset all schemes for daily exercise, throwing one back in one's work, especially as staleness makes its appearance. I, of course, am more directly concerned with weight-lifting exercises than with any other, but, no doubt when I have given my views as to how one may steadily progress, and at all times make some little advance, however slight, and overcome the bugbear of training, then it will be found possible, to adapt my hints to other forms of exercise. In the first place, when you feel a little stale, yet, perhaps, not stale enough to make a total rest advisable, then when you lift, if you lift all weights, whether in practising feats or weight-lifting exercises, at such a poundage that they can be readily raised with ease and comfort, it will be found that your work is once more a pleasure, and shortly you may return to your usual poundage. The bugbear of training loses half its fearsome aspect to the tired athlete who has a lot at stake, and must continue at his work, if it be done in company with a friend or friends. There is nothing so fatiguing as the raising of iron weights time after time with no one to watch, no one to encourage, no one to advise - to express surprise at your improvement. To surprise and beat your friends is always and encouragement, and in practising with weights you cannot get the right positions unless you have an expert lifter to occasionally offer a hint. Lifting, too, may become dangerous if practised by oneself, so you see the idea is to endeavour to make your training as much a pleasure as possible. If necessary, enter into little competitions with your friends. I had almost said a small bet would be an incentive to work, but I suppose I must include betting among the list of vices we human beings are apt to give way to, but this will not preclude one from a friendly competition occasionally in which points may be conceded, and lifts performed on handicap and competition lines. Carefully adjust your work to your condition at the moment. Ask yourself each time you lift, "Am I in good form to-day?" 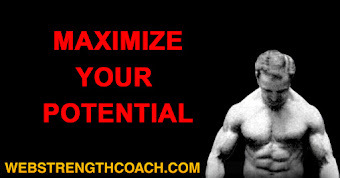 If you feel yourself in good form - specially "fit" - then that is the time to try a "limit" lift. Note what you have raised that day - the weight and the date - and at another suitable time see if you can surpass your last record lift by a few points. Such pleasant, invigorating and helpful aide to training as massage, towel friction, and sponge-down, are all direct helps in aiding you to continue constantly and persistently with the practice. Without regularity good results cannot be expected, yet immediately your mind, always questioning your condition, and ever ready to appreciate a weakness, tells you that you are stale, an immediate and entire rest is imperative. To go on when stale is to invite an entire breakdown. I have known even nervous exhaustion to attend the misdirected efforts of the athlete who persists in hard training when he feels himself going to pieces through over-work. To try to work like a machine, knowing that ever at one's side stands the bugbear of training, ready to weaken one's resources through over-work, and bring about a breakdown, is the height of folly. Nature has given one an instinct which will make heard, with warning notes, the danger signal when over-fatigue threatens, and this signal should never be allowed to pass unnoticed. Whilst on this subject, I would point out that the man of sedentary occupation can never hope to stand the same amount of physical work as regards weight-lifting as his fellow, who is a manual labourer, and whose muscles are daily tuned to mechanical labour, which drains the system least of any, whilst brain work is a constant and steady drain on the whole system, and it will, no doubt, surprise many to learn that the brain-worker is more likely to suffer from over-work than the man who, like myself, daily performs arduous feats which are purely muscular. When the brain-worker changes to physical work, he finds the change helpful, inasmuch as a change of work is as good as a rest, and, therefore, he will not, of course, regard the lifts he practices as work, but a pleasant pastime. -- Our challenge and offer of L50 to anyone who might lift my heavy bar-bell remained unaccepted, night after night, so we hit on the idea of unloading the bell, and leaving it quite light and empty at the entrance to the place of entertainment we were appearing at. Naturally the strong men of the town came round and tested the bell privately, and on finding how easily they could lift same, they all were certain the L50 was as good as in their pockets. That night, instead of a dead silence as before, when my challenge was issued, quite a number of eager weightlifters anxious to improve their financial position, jumped into the ring, and rushed for the bell, which I had raised easily with one hand, but much to their surprise, the 150 lb. bar bell had changed into a 300 lb. one, and the disappointed weightlifters retired scratching their heads in an endeavour to understand the trick which had been played on them. 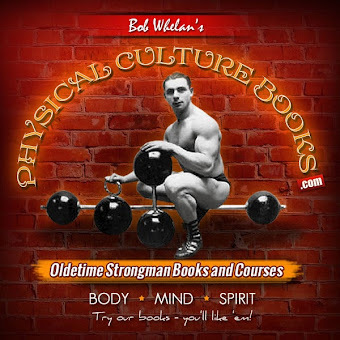 Naturally, most of the incidents which come into my mind likely to interest readers of this book are connected with weightlifting. When a man has the ability to raise enormous weights, he also has the ability as opportunity occurs to create a surprise wherever he may be when the question of strength crops up, and though I always make a point of avoiding the practice of posing and bragging for personal glorification, yet, when it has been necessary, I have never hesitated to take off my coat and convince certain doubters who have thrown discredit upon my feats and expressed their unbelief about the records which I have established from time to time. I remember at one time much correspondence taking place between certain readers of a magazine called "Vim" and a Mr. Donald Dinnie (the renowned Scottish athlete), who denied my ever having performed the lifts I claimed, and whose contention was, I believe, that I was not heavy enough to do all that I said. To convince this gentleman, I called on him in company with my two brothers, Hermann and Kurt. He had a bar bell weighing about 230 lbs, and he did not seem at all sure that I could lift this with one hand. It was a very short and awkward bar bell, but I said to Dinnie, "Tie a 56 lb. weight to it." After this had been done I pressed the weight (286 lbs. In all) with one hand, to the evident surprise of Mr. Dinnie, who immediately was transformed from one of my most severe critics into one of my warmest supporters, and I believe at this moment he would support me against any man in the world in a weight lifting contest. Later, using the same bar bell with a 56 lb. weight tied AT EACH END, I raised with one hand from the shoulder, 342 lbs. I believe this so surprised Mr. Donald Dinnie that he could hardly speak, and he at once wrote to the Magazine withdrawing his previous statements, and saying, "he believed me to be the best weight lifter extant." At Birmingham, I was confronted with Mr. McCann's bar bell weighing 222 lbs., and requested to try same. 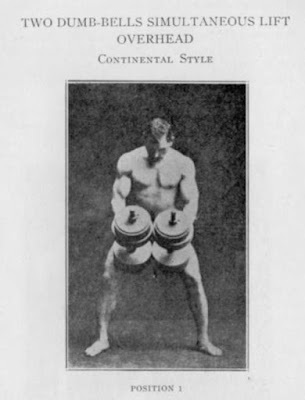 Mr. McCann, it will be remembered, is the man who defeated Sandow in a weightlifting competition some years ago. His bar bell was at Gough Street, Birmingham. They also had two 56 lb. square weights which they said had never been lifted with one hand. The weightlifters present, were I believe, considerably astonished when I placed the 222 lb. 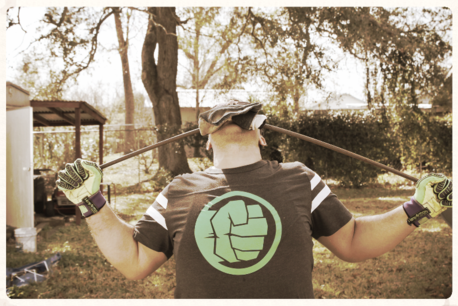 bar bell into my right hand overhead, and brought with the left hand the two 56 lbs. both together to arm's length, whilst holding aloft the 222 lb. bar bell. This is to certify that Mr. Arthur Saxon, this morning lifted 331 lbs. from the shoulder to above the head with one hand only. This exceedingly difficult feat can be better appreciated when it is taken into consideration that it was not one weight only but was composed of a 160 lb. bar-bell with a 90 lb. dumb-bell tied on one end, and an 81 lb. dumb-bell tied on the other end. On another occasion when a certain weightlifter said, that although I was a good one-handed lifter, he did not believe I was good with two hands, I raised 142 lbs. in the right hand, and 134 lbs, if I remember rightly, in the left hand, in a clean double-handed lift to the extreme surprise of this particular lifter who could hardly manage to raise one of these dumb-bells (which had a tick handle) up to his knees even. At one time there was considerable dispute as to the authenticity of my different performances. 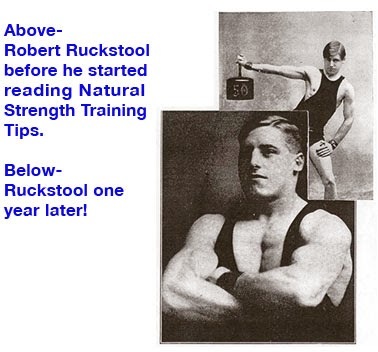 To satisfy their readers, the well-known magazine "Health and Strength" sent a special representative to test my weights. He brought his own scale with him and tested every weight before and after it was lifted. At this particular test performance I succeeded in raising 314 lbs. with the right hand from the shoulder, snatching 190 lbs. with one hand, jerked a bar-bell weighing 340 lbs., from the shoulder with both hands, and holding in the right hand a weight of 267 lbs, I brought over head with the left hand an awkward ring-weight weighing 119 lbs. these feats were mentioned in an article which appeared in Health and Strength for October, 1903. The same gentleman came unexpectedly to the Grand Music Hall, Clapham Junction, and weighed my bar bell after I had lifted it at my performance and found it to be exactly 300 lbs. it appeared to surprise him greatly. 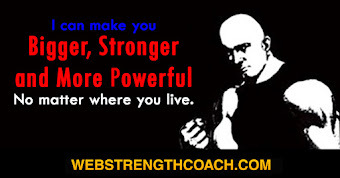 I may say that ever since, I have had the support of the Health and Strength magazine as the "Strongest man on Earth." A feat which never fails to surprise my friends is that of raising two 56 lb. 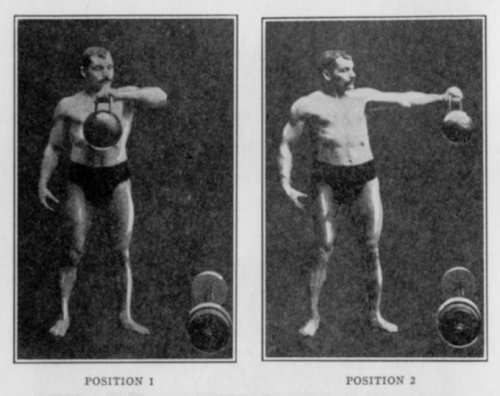 square weights in each hand above the head in a clean lift. The best lift I have yet performed was at Stuttgart, in Germany, on December 12th, 1905, where in the presence of a number of weightlifters and a representative of the leading sporting paper, I pressed with one hand 370 lbs. the local "strong man" wished to test the weight and was allowed to do so, but could not raise it to his knees with both hands. At the end of this book I have given my records and measurements, also those of my brothers Hermann and Kurt, and I wish to say that in all cases the reader may rely on absolute accuracy in both measurements and records, as I have no wish whatever to exaggerate or distort in the slightest, and I am confident this book will convince every reader that I am a genuine strong man struggling in the face of much opposition to prove my ability to raise the weights which I claim as records, and I at last believe I have succeeded in convincing the majority of weightlifters that I am bona fide in every way. I will take this opportunity of thanking the editors of the Health Magazines, and also the editor of Sporting Life for their kindness in sending representatives to weigh my weights, and in giving testimony in their publications, as to the genuineness of my lifts. THE STRONGEST MAN ON EARTH, UNDOUBTEDLY. PRESENTED TO ARTHUR SAXON, BY E. H. BOSTOCK, ZOO CIRCUS, GLASGOW, 30th November, 1900. I much esteem this presentation, as you may be sure Mr. Bostock made strict enquiries into my claims before presenting me with such a splendid award.